Gone are the days of the notorious Karangahape Road. With plenty of new haunts luring us into these were mean streets, K' Rd has seemed to have flourished into one of Auckland's top dining and drinking precincts. But, if a number of notable name drops or post-weekend water-cooler chats weren't enough to get you book your next rendezvous along the strip, then perhaps newcomer 69 will. After meandering Karanga-hip-y road (since it's so damn hip now) we found ourselves peering through a glass pane front door. Windows draped in thick dark curtains enveloping the space, only allowing reflections to be seen. How mysterious. Perched on the corner of the olds Legends building and proudly overlooking the pink path cycleway and busy Northern Motorway, 69 is close to being one of the best inner city oases. As you step off the street into this dimly lit intermit industrial bunker, you're engulfed by the relaxed atmosphere that the folks at Paul Izzard Design have captured. The fitting restaurant description would be cocktail and late night diner, with an array of intimate dining tables, open plan kitchen, silky tunes and a small balcony off to the side. Swiftly seated in one of the two spa pool seats, perfect for groups, we're handed a set of menus. 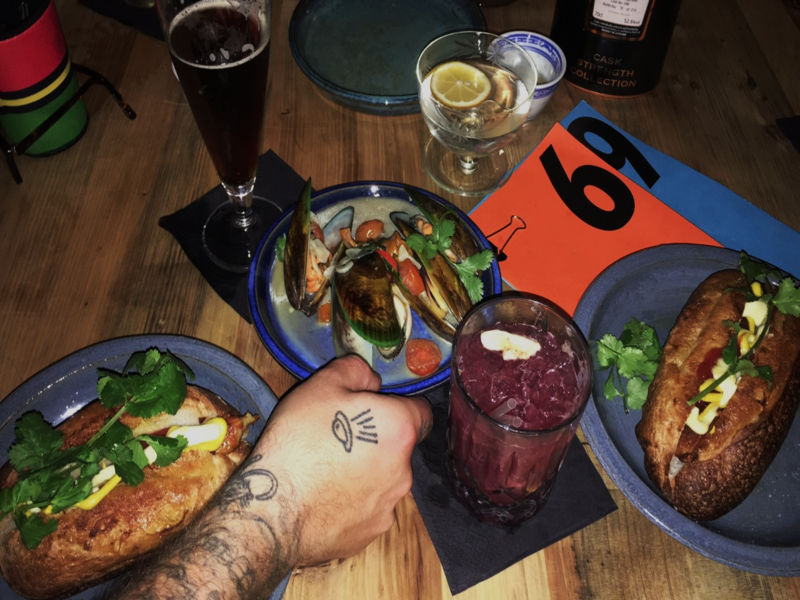 The '6' offers food from a range of street dogs, sharing plates and an array of sides. Then there's '9', a larger blue menu that is full of drinks, from their extensive range of cocktails, wine, beer and a number of single-batch, independent whiskies for good measure. After some quick table levelling, a large jug of complimentary hot sweet tea descends on the table and we proceed to order nature's finest nectars. Dressed in plaid shirt and trucker cap, the waitress recommends a 'Lobo Be Where' ($15) complete with Brazilian spirit Sagatiba, banana, cane sugar, and acai, plus a tall Monteiths RPA ($9). Flicking through the menu, you'll be quickly impressed by their ever-affordable options. K' Rd-inspired street dogs ($9), oysters, mussels, clams ($1.50/each), unascertained beef ($25), lamb ($20) and grilled, steamed, fried or roasted fish ($6). Not to mention a range of small plates (Smackeroos) and sides (Slip in Sides) that include $2 fried onions. We went for a Hot Classic: a thick and saucy kransky with a wee kick from the yellow wasabi mustard and enveloped in a soft, yet ever so crispy on the outside bun. Plus, at no fault but our own, an annoyingly odd number of Green Lip Mussels to finish us off. Opening from 3pm till 3am, 69 will hands down become the local nightcap, feeding frenzy or long night lounging spot. They've really covered all bases. I hear when summer decides to roll around they'll be throwing the curtains open and lining up outdoor dining.